The Colossian people are walking on shaky ground. Imagine how hard it must have been to grow the first church. This new way is radically different from the faith they knew before (or didn’t know before). There’s no generations to look back on and learn from. There aren’t a lot of leaders to look to. They were excited with the message at first, but life is getting in the way. False teachers are muddying the truth they’ve heard. And now, they don’t know which end is up. But, Paul doesn’t focus on what they lack. He doesn’t dwell on their shortcomings. He points to what they have. And it’s all they need. It’s all we need, too. As the Colossians search for solid footing, Paul begins this week’s passage (Col. 1:15-2:5)(Week 3 of “Complete in Christ“) by laying out the preeminence of Jesus. He pretty much controls the air we breath, along with the rotation of the planets. We can trust our God. There’s no more insecure feeling than when you feel alone. That you’re the only one. That’s why God points us back again and again to living in community. This passage is no exception. Colossians 2:2 (ESV) says, “ that their hearts may be encouraged, being knit together in love.” This is the effort for which Paul labors. A community that is knit together, their lives interwoven, dependent on each other. A bond of love that holds them together as they walk forward, hand in hand. They learn from each other. This is God’s design. I have a feeling this is another one of Paul’s “prophetic prolepsis” statements. While I don’t know the full picture of the Colossians people during the time of Paul’s letter, my general sense is that they were struggling. I get that feeling from the urgency in Paul’s message to clarify the truth. Yet, he seems to commend their “good order” and “firmness” in the faith. While their faith may not yet be in good order and while their confidence may waver, these are the Colossians’ marching orders. This is what they are to work toward. Both “good order” and “firmness” are military metaphors. Which opens the door to all sorts of metaphors about a military model and how it parallels our journey with God. But, mostly, it says to me that we are to have structure, discipline and intentionality in our faith walk. While there is unimaginable grace that covers our lives, we must give God our very best efforts. Our intentional pursuit. 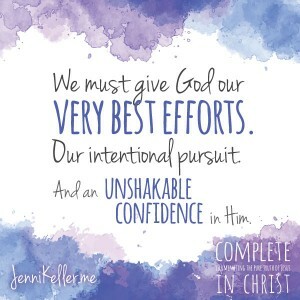 And an unshakable confidence in Him. How did God speak to you through this week’s passage?